Queen Elizabeth II is now the longest reigning monarch the world has ever seen, and in her 66-year reign over the United Kingdom and the Commonwealth, she’s seen many historical events pass – World Wars, deaths of world leaders, and historic events such as the EU referendum. On Saturday 21st April, the monarch is also set to celebrate her 92nd birthday. So we thought, why not celebrate with a collection of Queen pictures that sum up and mark some of the most important moments in her royal career? Here is an official portrait released in honour of the Queen's Sapphire Jubilee - marking 65 years on the throne. The Queen co-ordinated her outfit with matching sapphire jewels and dress. The Queen is famously a huge horse-riding fan, and has continuously been seen out and about riding throughout her entire 65-year reign. Most recently, the Queen has impressed everyone by still venturing out on horseback at the ripe old age of 90. And she always dresses up for the ocassion, wearing a headscarf wrapped firmly around her head. Queen Elizabeth was all smiles as she arrived at Liverpool Lime Street station after travelling north by train. The Queen was joined by Prince Philip to formally open the Exhibition Centre Liverpool. The couple also greeted crowds from the balcony of the Town Hall, and are due to open the new £237m Alder Hey Children's Hospital. Queen Elizabeth changed out of her pink ensemble and into a floral dress for lunch, in another display of fashion daring as she seemingly shuns her usually-favoured matching ensembles for something a bit different. And judging by the smile on her face, she's enjoying trying something new! Queen Elizabeth II has always been a huge fan of horse racing, and regularly attends big meetings such as Royal Ascot and Cheltenham. Her Majesty stood out amongst the crowd at Ascot in 2016 in an eye-catching orange dress with blue floral detailing and blue coat. Could this top the luminous green ensemble she wore at her 90th birthday celebrations? The jury is still out. See what the Queen got up to for her 90th birthday here. To mark her 90th birthday in 2016, the Queen graced the cover of Vanity Fair magazine for the second time after she sat for a series of portraits, shot by photographer Annie Leibovitz. Annie also photographed her birthday portraits (featuring other members of the royal family) but two of these images were exclusive to Vanity Fair. The cover image sees the Queen alongside her beloved corgis: Holly, Willow, Vulcan and Candy, and she is also pictured inside the magazine with husband Prince Philip in the Oak Sitting Room at Windsor Castle. Speaking of the photoshoot, Leibovitz told Vanity Fair: "The most moving, important thing about this shoot is that these were all her ideas. She wanted to be photographed with her grandchildren and great-grandchildren; her husband, Prince Philip; her daughter, Anne, the Princess Royal; and her corgis. I was told how relaxed she was at Windsor, and it was really true. You get the sense of how at peace she was with herself, and very much enthralled with her family." This photoshoot came after the Duchess of Cambridge was shot for the front cover of Vogue's centenary issue. During the last big parliamentary set piece before the EU referendum, Queen Elizabeth unveiled a government programme including plans for the UK's first spaceport and a major overhaul for the country's prisons. Her Majesty arrived at Westminster with Prince Phillip wearing a stunning white floral gown and tiara. As ever, Queen Elizabeth looked regal and elegant, dressed in classic formal dress, to perform her royal duties. The Queen was pictured wiping away a tear in a rare public display of emotion as she joined wounded veterans to pay tribute to fallen soldiers in 2016. The monarch isn't usually seen displaying emotion in public, but has been seen to do so, most usually at war memorials. A day before her 90th birthday, on 20th April 2016, Her Majesty stepped out with Prince Phillip to officially open the new bandstands at Alexandra Gardens in Windsor. The monarch met children from the six schools involved in designing the bandstand's commemorative plaques. For the occasion, she opted for a bright pink coat and hat pairing, demonstrating that being fabulous has no age limits! The Queen stepped out in a stunning turquoise ensemble at an engagement at Windsor Castle for Royal Maundy in 2016. Her Majesty handed out commemorative coins to 90 men and 90 women, each one representing her 90 years on the throne. In honour of Her Majesty Queen Elizabeth II, the new Crossrail opening in December 2018 has been renamed the Elizabeth Line. The new name was unveiled at a ceremony at Bond Street station in 2016, which was attended by the Queen herself, the then London Mayor Boris Johnson and Transport Secretary Patrick McLoughlin. This picture of the Queen sees her Majesty presented with her first 90th birthday cake in 2016 - three months early - from the women of the West Newton's Women's Institute. The Queen looked resplendent in red as she attended a traditional Sandringham Christmas Day service in 2015. She was the first to arrive at the service, which was also attended by the Duke and Duchess of Cambridge, and looked very happy to be following traditions with her family. Her festive red dress coat certainly set the tone for the occasion. Paired with an umbrella to tackle the wet weather conditions and a beaming smile, she celebrated the last Christmas before entering her 90th year in style. This photo marks the day the Queen became Britain's longest reigning monarch, surpassing her great-great grandmother Queen Victoria, having been on the throne for 23,226 days and 16 hours. She stepped out in Scotland for the opening of the £294 million Scottish Borders Railway, wearing a gorgeous blue coat and hat. The ensemble, which features two contrasting hues of blue, perfectly encapsulates all that the Queen represents. It is smart and elegant as ever, accentuating her regal and graceful persona. In this photo, Queen Elizabeth II commemorated the 75th anniversary of the start of the Battle of Britain. The Duke of Edinburgh, the Duke of Cambridge and the Duke of York joined her Majesty to watch an RAF flypast from the balcony of Buckingham Palace. On a state visit to Germany, the Queen showcased an array of gorgeous outfits. Pictured here with Prince Phillip, she chose white which showed off her regal red sash. The Queen is pictured here with the former and 44th President of the United States, Barack Obama. Obama was on a special state visit to the UK, and visited Windsor Castle to meet with the monarch. An adorable moment is captured here, as the Queen is seen chatting to her youngest great-grandson. George looks adorably puzzled whilst looking up at his great-grandmother. It's one of the only photos around of the pair together. And, the first known picture of the Queen with little Princess Charlotte. This was taken at her christening at the St Mary Magdalene Church in Sandringham. The Queen is seen here at the 2015 Royal Ascot, where her horse Estimate, won the big race. It's the first time ever that a reigning monarch's own horse has won the prestigious title. Arriving at King's Lynn railway station for her annual Christmas holiday to Sandringham in December 2014, Queen Elizabeth looked ready for her break in a tweed coat and floral headscarf, one of her signature off-duty looks. The first known picture of the Queen and her first great grandson, Prince George, at his christening in 2013. The Queen was spotted leaving Kensington Palace some months before this picture after having met the young Prince for the first time. The Queen looked regal during a visit to Westminster Abbey to celebrate her coronation anniversary ceremony. But what does a Queen wear to celebrate 60 years on the throne? Queen Elizabeth chose a shimmering oyster ensemble with matching hat and black court shoes. Not letting a bit of rain scupper her plans, the Queen travelled to East London dock with the Duke of Edinburgh to name the royal barge leading her Diamond Jubilee pageant. She brightened up the gloomy London skies in a red coat and hat as she wandered around the 94-foot Gloriana. Her Majesty is seen here overseeing the opening ceremony of the London Olympics back in 2012. The Queen also gave a speech at the national event...and then, there was the famous Bond moment we can't overlook! A month after the celebrations of her grandson, Prince William's, wedding, back in 2011. The Queen donned a startling blue hat, with dazzling white coat adorned with matching blue buttoms. The Queen looks resplendent in yellow at the wedding of the century - that of Prince William and Catherine Middleton, back in 2011. The Queen looks jubilant in a smart emerald green ensemble in 2010. The Queen was seen having a brilliant day when she turned 80 back in 2007. She and Philip hosted a children's party at Windsor Castle, and attended a party in the evening to celebrate the event. 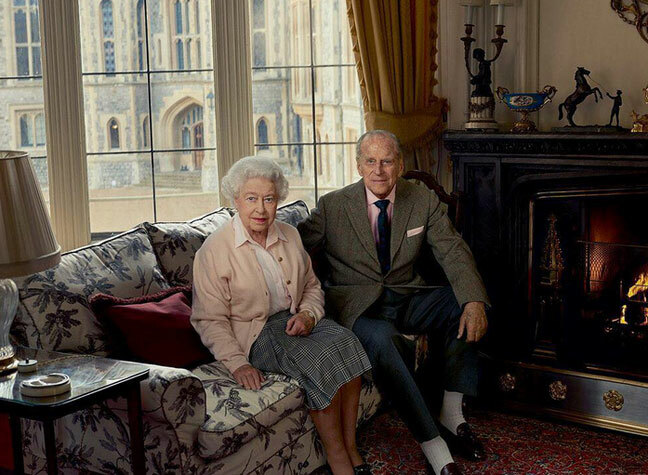 An official portrait taken of Prince Philip and the Queen, released in honour of Her Majesty's 50th year on the throne - her Diamond Jubilee. One of the saddest photos of the Queen's reign; when she attended the funeral of her mother - known as the Queen Mother - in 2002. The Queen is seen here on her Golden Jubilee tour in 2002, celebrating 50 years on the throne. The monarch rocked one of her favourite signature block colours - canary yellow - to mark the occassion. One of the facts that's so well known about Her Majesty is her unwavering love for her pet corgis, which she has kept throughout the entire 65 years of her reign. She's seen here in 1994 walking one across the lawns of Buckingham Palace. In 1992, Queen Elizabeth II made a landmark speech at the Guildhall in London, regarding her 'annus horribilis' - a horrible year. During the speech, the Queen made an appeal to the public to change their treatment of the royal family, asking for more understanding following months of personal turmoil. It was the year that two of her children had been through a divorce, and that news of the affair between Charles and Camilla Parker-Bowles, whilst he was apparently married to Princess Diana, surfaced. The Queen is pictured here alongside Prince Charles and Princess Diana at their wedding in 1981, on the balcony of Buckingham Palace. The Queen embraces a shot of lemon yellow colour in 1979. She's gone on to be known for her love of bright colours. Queen Elizabeth II and Prince Philip celebrate the 30th anniversary of her accession at Sandringham House in 1982, in this official portrait. Queen Elizabeth and Prince Philip on the balcony of Buckingham Palace waving to the crowds on the celebration of the Queen's Silver Jubilee on 7th June 1977. The Queen is again pictured here waving to crowds as she celebrates her Silver Jubilee, marking 25 years on the throne. Princess Anne, the Queen Mother and Queen Elizabeth II in the Waterloo Room of Windsor Castle in 1972. It's a rare snap of the three generations together. Queen Elizabeth II at Archers Hall, Edinburgh, Scotland, wearing the sash of the Order of the Thistle in 1972. Queen Elizabeth pictured at Buckingham Palace - one of her main residences - in 1971. Queen Elizabeth with Prince Andrew and Prince Edward. Queen Elizabeth's Christmas message at Buckingham Palace in 1969. Queen Elizabeth, with one of her beloved pet corgis in 1969. Elizabeth II is pictured here next to former US President, Ronald Reagan. The pair famously enjoyed a good relationship. Reagan is one of 13 presidents the Queen has known in her reign, beginning with Lyndon B Johnson. However, Lyndon is the only President the Queen never met with (although she is yet to meet President Trump). Queen Elizabeth II and Prince Philip arriving at London's Royal Festival Hall to attend a concert in 1962. Queen Elizabeth ll leaving St Brides Church, Fleet Street in 1959. Queen Elizabeth II of England in 1956. This official portrait is perhaps one of the most recognisable images of Her Majesty of all time. A picture taken at the Queen's coronation at Westminster Abbey on 2nd June 1953, when she was just 25 years old. The Queen took up the throne after the death of her father, King George, and become one of the youngest ever monarchs. Queen Elizabeth II and Prince Philip at Buckingham Palace in 1952. One of the earliest official portraits of the couple. Princess Elizabeth with her husband Prince Philip, the Duke of Edinburgh, and their children in 1951. In 1948, the Princess gave birth to her first child, a son, providing an eventual heir to the throne. Prince Charles was born on 14th November, and is the eldest of Elizabeth and Prince Philip's four children. A very special moment, when the now Queen announced her engagement. One of the first pictures to emerge of a young Princess Elizabeth and Lieutenant Philip Mountbatten following the news in 1947. A young Princess Elizabeth on her first royal tour with her parents, to South Africa. The future Queen also celebrated her 21st birthday during the trip. Princess Elizabeth in the White Drawing Room of Buckingham Palace, London in 1947, in the year that she met Prince Philip. In February 1945, the Princess joined the Women's Auxillary Territorial Service as an honourary second subaltern. Whilst there, she also trained as a mechanic and was later promoted to junior commander. It was one of her very first royal duties, and many members of the family have followed in her footsteps and taken part in military duties. Princess Elizabeth looking relaxed with one of her beloved horses at Sandringham, Norfolk in 1944. A young Princess Elizabeth and Princess Margaret in 1931. Back when the Queen was a bonny baby, and still a princess, this beautiful photograph was taken.